Sheldon Silver and the history of “Legislative Corruption”. A cartoon that appeared in the American weekly Puck in 1889. The “bad old days” are the bogeyman of New York politics. By servicing anyone other than oligarchs, this typically race-inflected story goes, Mayor Bill de Blasio risks the return of crime, grime and graffiti. 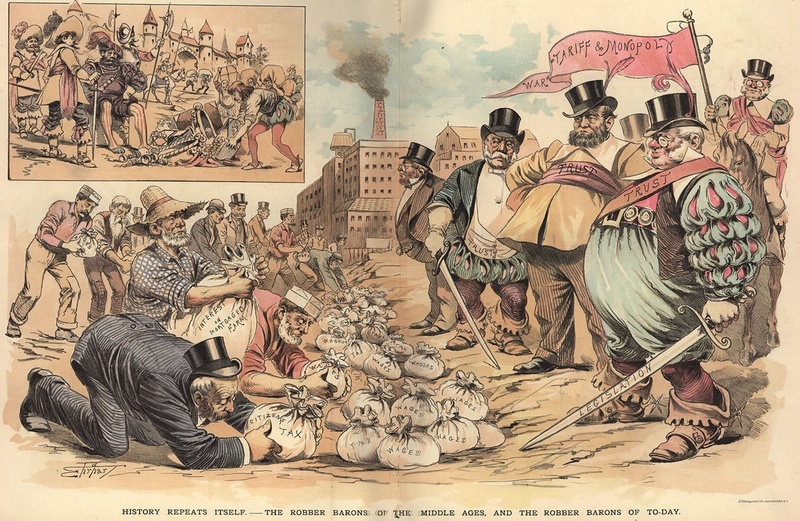 But the indictment of New York State Assembly Speaker Sheldon Silver should make us think of other “bad old days” from the state’s past—the first Gilded Age—when Tammany Hall and its accomplices, the robber barrons (a term coined in the 1930s by Nationite Matthew Josephson), ruled the roost. A member of the Legislature has almost always from one to a dozen pet measures upon the success of which his political future may depend. He soon finds that he can do nothing with these, however just they may be, without pledging his support to other schemes which may not commend themselves to his judgment. Thus he is driven to take the first step in trading his vote, and soon finds himself ensnared into the support of bills which he knows to be opposed to the public good. Having gone so far, it is plausibly urged upon him that, since he must sacrifice the public interest, he might as well gain some little private advantage. And having once voted for a bill because of a “friend” in it, or in the expectation of a share in its profits, it is easy to take the next step and accept a direct bribe. In this way many respectable men who commence public life with a horror of bribery gradually sink into habits of corruption.